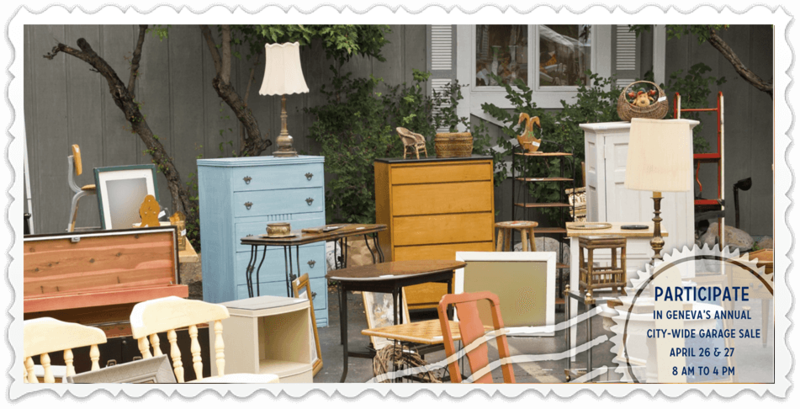 Clean out your Attic, Basement, Closets and hold a garage sale at your home during the City-Wide ABC Garage Sale Friday, April 26 and Saturday, April 27. Geneva Chamber of Commerce will do all the advertising, printing and distributing of signs and maps of all participants to key locations in Geneva. Apply online and submit your registration fee of $30 via credit card. If you prefer, you can download an application form and mail it with your check payable to the Geneva Chamber of Commerce at 8 S. Third Street, Geneva, IL 60134.
between 9 am and 4:30 pm to pick up maps, signs and instructions. Hold your garage sale on both April 26 and 27 from 8 am to 4 pm. Have fun and keep all the profits! Special items for sale will be included in the printed and online map. Applications received after April 16 will have their addresses and items included on the online map only. If you register after April 23, you will receive signage only.